‘Has any popular violin concerto had a shakier start in life than Korngold’s? Born into a post-war America where critics (if not audiences) were newly allergic to romanticism, it also had the mixed blessing of a premiere recording by Heifetz: glorious in its way, but hugely influential and the basis of a performance tradition that hasn’t always served the music well. Enjoyable though it can be to hear this bittersweet song of exile performed with mile-wide vibrato and Beverly Hills lushness, it isn’t – or shouldn’t be – the only way. Caroline Goulding and Kevin John Edusei follow the recent, Gramophone Award-winning path of Vilde Frang, among others: toning down the technicolour and emphasising the music’s Viennese roots. Goulding, a laureate of the Sommets Musicaux de Gstaad has a fine, sweet but penetrating tone. She shapes phrases expressively but never overdoes the (fairly generous) rubato that Korngold has already written into the score; Edusei and his Berne orchestra respond alertly. It helps that Goulding isn’t over-miked (often a temptation in this concerto): she’s realistically placed against an almost Impressionist orchestral soundscape, in which the harps and tuned percussion seem at times almost to melt into the texture. While the finale certainly sparkles, the result, overall, feels like a real conversation. Tune in to Fred Child host NPR’s ‘Performance Today’ to listen to Caroline Goulding and David Fung play Schumann’s ‘Bewegt’ from Sonata no. 2 for Violin and Piano in D minor, Op. 121 performed live in Fishtail, Montana, and a favorite from her debut album recorded in 2009 featuring pianist Christopher O’Riley: Gershwin’s ‘Bess You is My Woman Now’ from the opera ‘Porgy and Bess’, a rendition for piano and violin transcribed by Jascha Heifetz. This first concerto disc from young American violinist Caroline Goulding was gifted to her as 2017 winner of the Sommets Musicaux de Gstaad festival’s Prix Thierry Scherz. The finished article – a conceptually delicious matching of two composer-prodigies named ‘Wolfgang’ – exceeds expectations. First the Korngold, with its opening luxuriously romantic and dreamy, its orchestral sound a luscious and softy sparkling one, over which Goulding spins out long, supple, amorous legato lines. Don’t read that and think ‘schmaltz’ though; Goulding’s rich tone may be tender and sweet, but it’s also clean as a whistle, and delivered with will-o’-the-wisp nimbleness. Then there’s her cadenza: full-blooded romantic strength at one end, spiky and en pointe virtuosity the other, with the falling interval segueing those two halves delivered as an attention-grabbing portamento. On next to a soaring love song of a central Romance, followed by a cathartically effervescent finale, adding up to a beautifully gauged journey from start to finish. The Mozart brings both a spot-on stylistic gear shift, and a buoyantly glowing reading whose finale is a cracker for the way its rondeau theme wonderfully resists complete re-gentrification after its full-on earthy peasant stomp. Factor in that the recording is an acoustic beauty – Bern’s Diaconis-Kirche lends a lovely bloom and gentle spaciousness – and I love this one a little more every time I listen to it. Mozart erstaunlich kombiniert fenden Romantik, die ihm als Exilanten Er- folg als Hollywoodkomponist bescherte. Beide verwendeten für ihre Violinkonzerte Elemente aus früheren Kompositionen. Wunderkinder dürfen das. Und weil mit Caroline Goulding ein ebenfalls als Wun- derkind gefeiertes Talent am Werk ist, er- klingt diese CD als stimmiges Projekt. Zum Thierry Scherz Prize der Sommets Musicaux in Gstaad gehört eine CD-Auf- nahme. Die letztjährige Gewinnerin Caro- line Goulding spielte mit dem Berner Sym- phonieorchester zwei Violinkonzerte ein, deren Kombination erstaunt: Mozart und Erich Wolfgang Korngold. Die 26-jährige US-Geigerin weiss, dass diese Komponisten nicht nur dank dem ge- meinsamen Vornamen zusammenpassen. Beide wurden als Wunderkinder vorgeführt und erkämpften sich ihre Unabhängigkeit durch musikalische Eigenwilligkeit. Mo- zart (1756–1791) übertrug seine Lebens- freude in hymnische Melodieseligkeit. Korngold (1897–1957) huldigte einer trie-fenden Romantik, die ihm als Exilanten Er- folg als Hollywoodkomponist bescherte. Beide verwendeten für ihre Violinkonzerte Elemente aus früheren Kompositionen. Wunderkinder dürfen das. Und weil mit Caroline Goulding ein ebenfalls als Wun- derkind gefeiertes Talent am Werk ist, er- klingt diese CD als stimmiges Projekt. Since then, the violinist, who turns 26 in August, has continued to have a high- profile career, performing extensively as a soloist with orchestras in North America, Europe, and Asia. She’s been a media darling, with appearances on NBC’s Today, NPR’s From the Top: Live From Carnegie Hall, and The Martha Stewart Show. 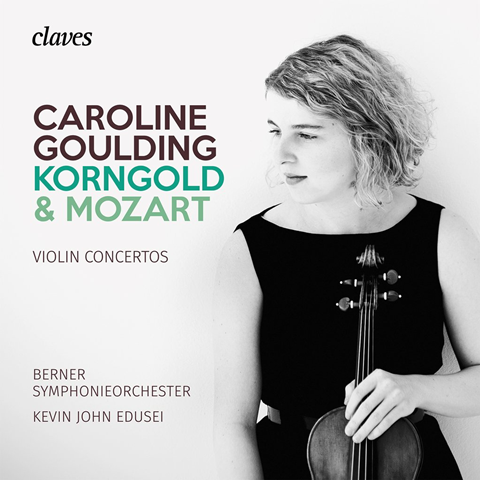 Her third album, of the Korngold Violin Concerto and Mozart’s A- Major Concerto, with the Bern Symphony Orchestra under Kevin John Edusei, was released this year by Claves Records. Live Footage from the 23rd Annual Festival of Faiths in Louisville, KY on April 25, 2018 at 7:30PM EST. Tune in to Performance Today hosted by Fred Child to listen to a LIVE performance from Tippet Rise of the final movmement of Schumann’s Sonata for Violin and Piano in D minor, Op. 121 with the brilliant David Fung filmed below, as well as a favorite: Schoenfield’s Tin Pan Alley from ‘Four Souvenirs’ with the amazing Christopher O’Riley. Cheers and Happy Easter to those who celebrate!